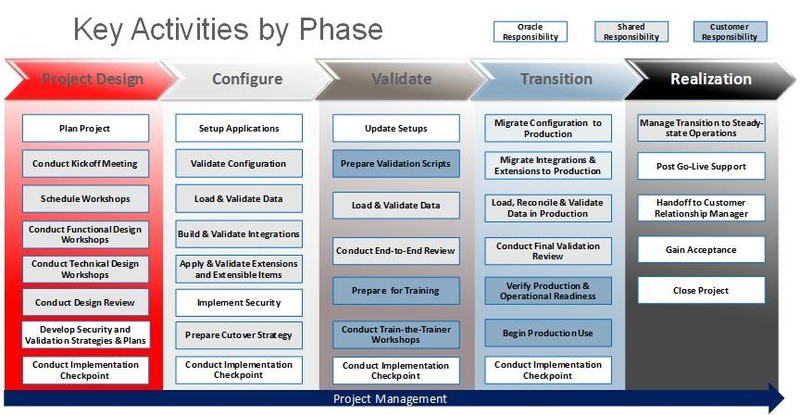 Having used many of Oracle’s project management methodologies over the past two decades of implementing it I’m always interested to see what their latest offerings have in store. More recently I’ve been implementing their Fusion applications so have taken a natural interest in Release 6.4 of Oracle Unified Method which has evolved to include an approach for their Cloud Application Services (CAS). OUM release 6.4 provides support for Application Implementation, Cloud Application Services Implementation, and Software Upgrade projects as well as the complete range of technology projects including Business Intelligence (BI), Enterprise Security, WebCenter, Service-Oriented Architecture (SOA), Application Integration Architecture (AIA), Business Process Management (BPM), Enterprise Integration, and Custom Software. Detailed techniques and tool guidance are provided, including a supplemental guide related to Oracle Tutor and UPK. Establish Governance Activity [previously Complete Project Management Plan] – Renamed and reframed to place greater emphasis on its main objective, which is to establish project governance by engaging in a dialogue to collaboratively define the processes which will be used to govern and control the project from start to finish. This approach recognizes that the delivery of documentation, while necessary and important, should be the by-product of rather than the driver for conversation. Project Management Plan (PMP) template [previously Project Management Framework] – Developed to streamline the process for documenting project governance. The BT.070 task was renamed to Create Project Management Plan and the guidance was updated. All related tasks that contribute to the PMP were revised to refer to the new PMP template eliminating the prior individual templates. 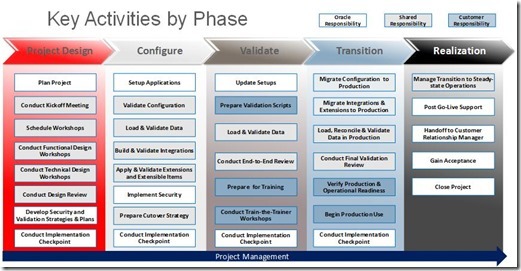 The PMP should be used to document the processes that govern the project. Once defined, the PMP will remain relatively fixed and only require updates if there are material changes to the governance. Acceptance Certificate [SM.040] Updated and Delivery Note [SM.040] Added - Clarified that acceptance, agreement, and acknowledgment should be secured using one of these templates. Removed signature boxes / sign-off pages and project manager countersignature from all templates. Bruce Dehner also has a really good overview presentation which talks about the Cloud Application Services Implementation Approach. It contains a pictorial view of the key activities at each implementation phase which also outlines who is responsible for doing what. The Oracle OUM Partner Knowledge Zone has an abundance of further information and resources. Here you can download OUM collateral, obtain training and certification and view webcasts. Certainly I’m looking forward to making use of the templates and deliverables in my existing and forthcoming implementations.